Christmas-themed horror films aren't exactly a thriving subgenre, but there have been a few gems here and there across the years. There just seems to be something a little more perverse about setting a horror film during the usually cheerful Christmas season, which could explain why few filmmakers have dared to tackle it. 1984's Silent Night, Deadly Night is perhaps the most famous (infamous?) example, along with 1974's Black Christmas (and its 2006 remake). Neither were great hits, although I stand by my assertion that Silent Night, Deadly Night is one of the nastiest yet most psychologically astute slasher films ever made (the less said about its repugnant 1987 sequel, the better). 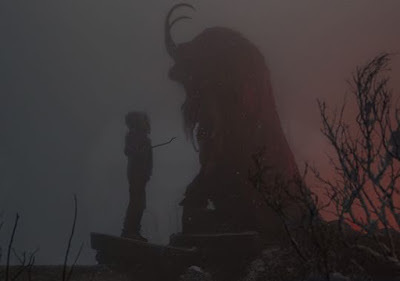 So Michael Dougherty's Krampus is somewhat unique in the history of horror films. Based on an ancient legend of St. Nicholas' demonic assistant who comes on Christmas Eve to collect naughty children and seek revenge against those who betray the spirit of Christmas, Krampus delves deep into Yuletide lore to deliver something wholly original, making it something of a breath of fresh air for horror aficionados. The film starts off like many other Christmas films; a dysfunctional family is gathering to celebrate the holidays, everyone's nerves are frazzled, and oversized personalities are starting to clash after being crowded together under one roof. But everyone still loves each other, right? Not according to young Max Engel, who is so frustrated by his family's constant fighting and lack of holiday spirit, that he tears up his selfless letter to Santa and tosses it into the wind. Little does he know that this act will soon bring death and destruction down upon them, and this year instead of a visit from St. Nicholas, the Engel family is about to be visited by Krampus, who has come to spirit the ungrateful family away for their lack of Christmas cheer. In that regard, Krampus is a spiritual thematic counterpart to director Michael Dougherty's last film, the Halloween cult hit, Trick 'r Treat, an anthology film about a vengeful Halloween sprite who seeks revenge on those who don't keep the spirit of Halloween. Krampus is a devilish good time from start to finish, blending elements of comedy, horror, and Christmas cheer into a slyly satirical look at just how far the modern iteration of Christmas, with its vacuous displays of greed and materialism (not to mention the imagined "War on Christmas"), has strayed not only from its original spirit of giving and goodwill, but from its pagan roots as a celebration of the winter solstice. What's more, it never takes itself too seriously, yet plays its ridiculousness completely straight, sending out legions of killer toys, evil gingerbread men, and even an evil Christmas tree angel to torment the family at its center (scored with eerily retooled version of familiar Christmas tunes by Douglas Pipes). 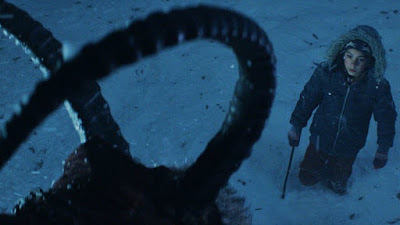 Krampus himself is an ingenious creation, using practical effects and puppetry rather than relying on CGI, giving the film the feeling of something out of the 1980s. It's refreshing throwback to see a modern horror film that's so creature heavy use CGI so sparing, but it really pays off, making Krampus a much more tangible (and frightening) figure in the film. In the end, however, there's a surprisingly warm heart beating at the film's center, It slyly tweaks Chrismtas movie conventions while in essence being a celebration of the Christmas spirit and the importance of family, with just a hint of wicked gleam in its eye. I walked out of Krampus with a big grin on my face - it's good fun no matter how you look at it. 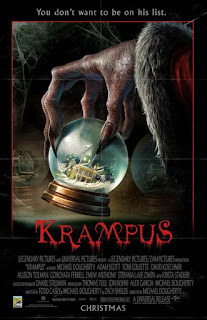 KRAMPUS | Directed by Michael Dougherty | Stars Adam Scott, Toni Collette, David Koechner, Allison Tolman, Conchata Ferrell, Emjay Anthony | Rated PG-13 for sequences of horror violence/terror, language and some drug material | Now playing in theaters everywhere. On "Star Wars: Episode VII - The Force Awakens"